Page Updated:- Sunday, 14 April, 2019. 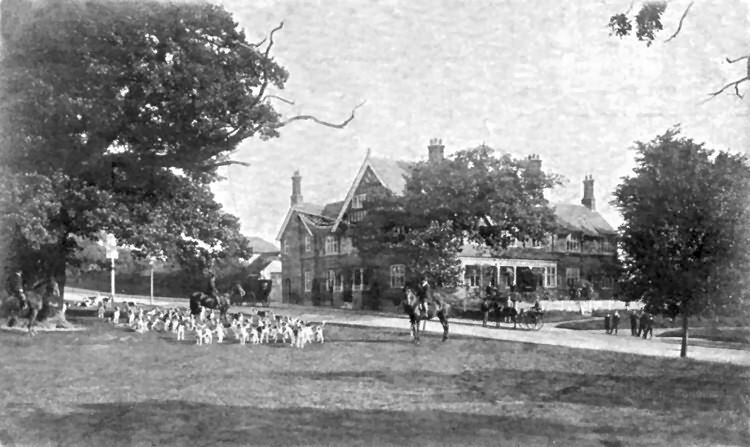 Above photo, 1903. Showing the same picture as above after a colourwash. 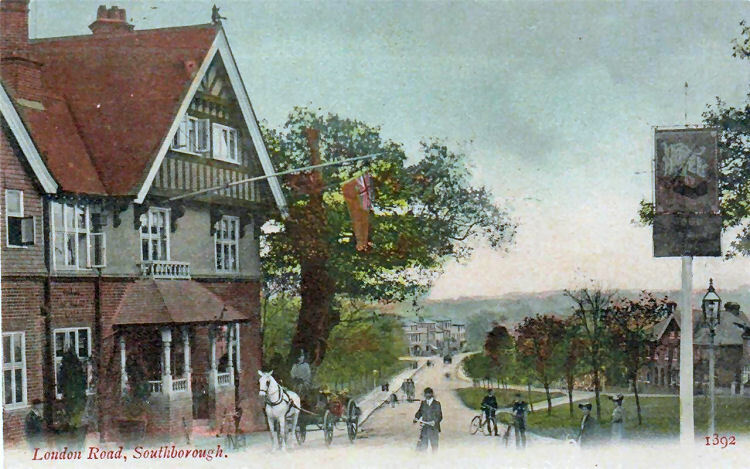 Above postcard 1904, kindly sent by Rory Kehoe. Above postcard, postmarked 1914. Kindly sent by Chris Murray. 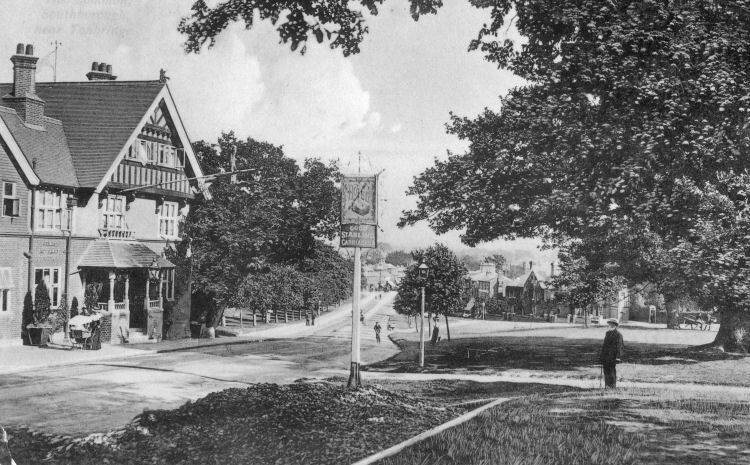 Above postcard, circa 1914, kindly sent my Mark Jennings. 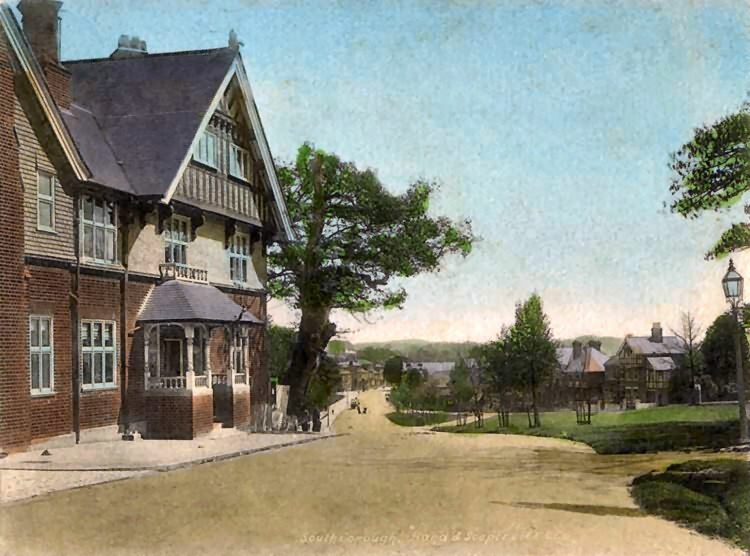 Above postcard dated 1903. Kindly supplied by Rory Kehoe. Above postcard, date unknown, kindly sent my Mark Jennings. From the Kent and Sussex Courier. 29 August 1873. Price 1d. 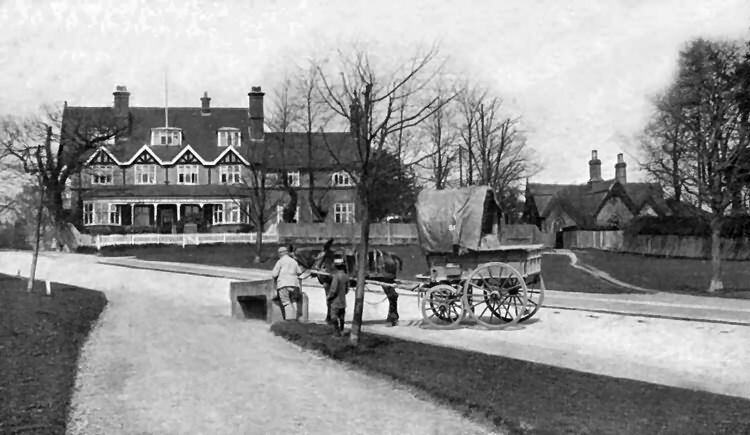 On Wednesday morning last, Mr. J. N. Dudlow, coroner for Kent, held an inquest at the "Hand and Scentre Inn," on the body of William Rhodes, aged 60, formerly a blacksmith of East Peckham, whose death occurred on Monday last under the circumstances detailed in evidence. Mr, N. Dunk, was chosen foreman of the jury. The body having been viewed the following evidence was taken:— Richard Hickmott, a stableman, deposed that the deceased lived next door to him, and on Monday night last, at about half-past 11 o'clock, the deceased's wife called him. He went in directly, and she then said she heard her husband fall on the floor, and she wanted witness to see what was the matter. Her husband was in the habit of sleeping by himself, and both he and his wife, who slept in another bedroom, had been to bed and asleep for sometime. The wife stated that her husband's falling woke her up, and when she went to see she saw her husband's feet laying outside. When he (witness) went into the front room of the house the wife gave him a light, and he then saw the deceased laying on his face. He took hold of his arm and lifted him up, and, observing blood all over the floor, he at once rushed off for the doctor, who came immediately. He believed the man was dead when he lifted him up, but did not stop to see whether he had cut his throat or not. When they returned he saw he had cut his throat, and was quite dead. A policeman was present, and he took a razor from the man's hand. Had noticed the deceased had been queer for the last week or two, and he had said he ought to be put away somewhere. He last saw him alive on Thursday night, but he was then more like a madman than anything else. P. C. Walter Norton said that at about half-past, eleven o'clock on Monday night he was called to the deceased, whom he found in the front room of his house lying on his face with a razor in his hand. His wife was upstairs at the time. His throat was cut, and he was lying in a pool of blood. The razor was in his right hand, and was covered with blood. Had known the deceased for years, but had never observed anything unusual about him, nor had ever heard that preparations were being made for his confinement. He believe deceased was given to drink. Dr. Colebrook said that at about half-past eleven o'clock on the evening in question, he was sent for and found the deceased lying on his face. He turned him over and saw he had cut his throat, from ear to ear, right through to the spine. All the vessels were completely severed and his death must have been instantaneous; He had a razor grasped in his right hand, which the police constable took from him. There could be no doubt he cut his throat with that razor. His mind was decidedly effected, and arrangements had been made by Mr. Wiseman the relieving officer for his removal to the asylum on the following day. The jury returned a verdict to the effect that the deceased committed suicide while in a state of unsound mind, and remarked that the conduct of Hickmott was praiseworthy. From the Kent and Sussex Courier, 24 August 1874. 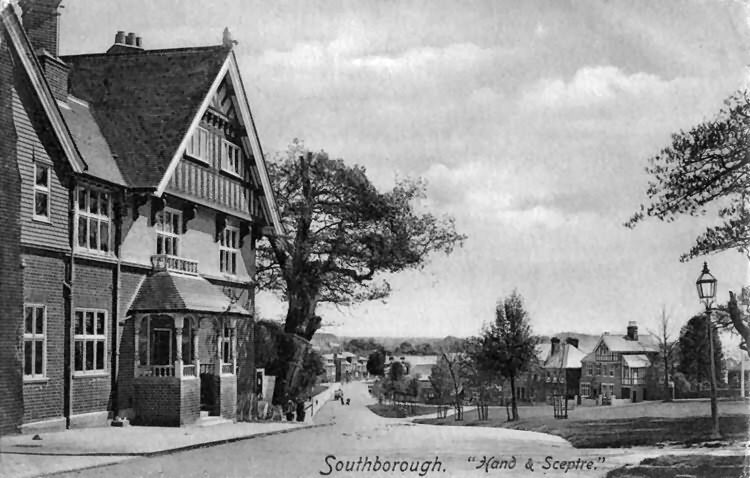 On the application of Mr. Warner, the Bench granted an extension of 1 hour to Mr. Hammond, of the "Hand and Sceptre Hotel," Southborough, on the occasion of a cricket match between the tradesmen of Southborough and the Southborough Cricket Club. 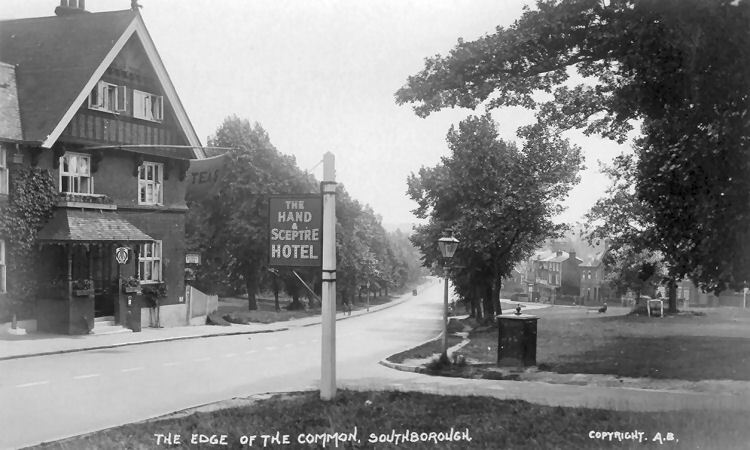 The "Hand and Sceptre" hotel. 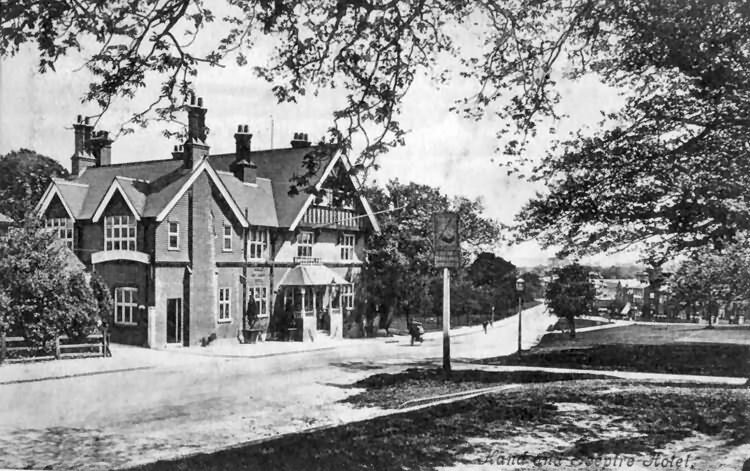 This well-known hotel has just changed hands, and Mr. William Wyles, son-in-law of Mr. Alfred Drake, the well-known proprietor of the "Railway Bell Hotel," Tunbridge Wells, has succeeded Mr. Hammond in the proprietorship. The actual transfer took place on Wednesday last, when they were a large number of persons present to witness the event. Mr. Tragmer, of Brighton, acted as valuer for the outgoing proprietor and Mr. Leonard Burton as gauger, while for Mr. Wyles Messrs Smith and Willis, of London, acted in the same capacities respectively. 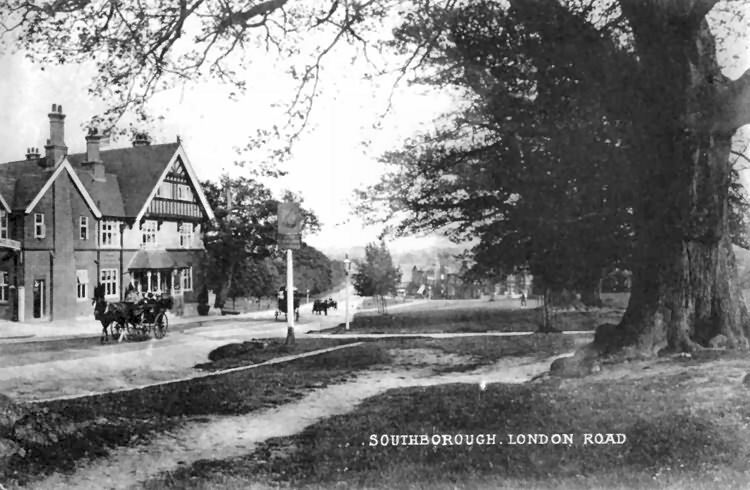 Mr. Wyles takes with him to Southborough a thoroughly good reputation, and we doubt not that he will be found to be the right man in the right place, and that under his management this well-known establishment will fully maintained it's ancient reputation. From Maidstone and Kentish Journal, 24th January 1895. TONBRIDGE POLICE COURT. AN EXTENSION REFUSED. 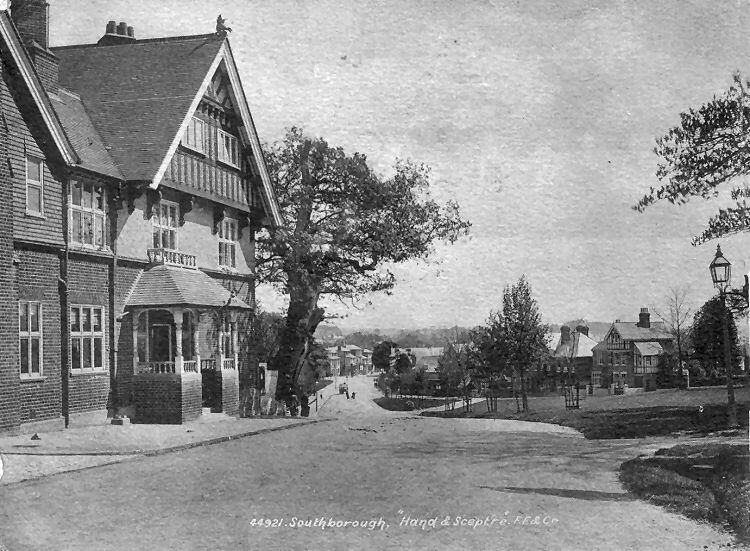 Mr Greaves, landlord of the "Hand and Sceptre" hotel, Southborough, applied for an extension of an hour for Wednesday, on the occasion of a smoking concert and private dinner, but the magistrates declined to accede to the application.